This green zone in northwest DC offers access to Rock Creek Park, the National Zoo and historic hotels. North of Dupont Circle – and across Rock Creek Park from funky Adams Morgan – genteel Woodley Park was one of several uptown neighborhoods where 19th- and early 20th-century Washingtonians escaped the summer heat. It still boasts historic architecture, including grand hotels, plus the modern buzz of good restaurants with sidewalk cafes. The neighborhood features a few iconic sights, including a Marilyn Monroe mural and two spectacular bridges, the Taft and the Duke Ellington. Its biggest attraction, the Smithsonian National Zoo, which backs up Rock Creek Park, is home to the city’s famed giant pandas. Getting there is a cinch: Just take Metro’s Red Line to the Woodley Park stop. From Andean bears to white-faced gibbons, about 1,800 animals make their homes at the National Zoo. The stars of the show are the giant pandas, but you’ll also find other fascinating critters like komodo dragons and African elephants living in an outsized habitat. A colorful carousel with horses, rhinos and ostriches to ride appeals to kids, as does a small train. Locals and tourists flock to Rock Creek Park, a tree-filled ribbon defined by its namesake waterway, encompassing 2,100 acres designated by Congress in 1890. It stretches to the Maryland border, but the major entrance (down a steep hill), is here in Woodley. Expect biking and running trails, workout stations and picnic spots by the creek. There’s also access to Pierce Mill, a working 19th-century grist mill, near the lower entrance to the zoo. The south end of the neighborhood holds two outsized historic hotels, the Omni Shoreham and the Washington Marriott Wardman Park. Harlem Renaissance poet Langston Hughes worked as a busboy at the latter in the 1920s. Close to the hotels and the Metro, Connecticut Avenue holds a busy strip of restaurants, many with sidewalk cafes. Choices include Lebanese Taverna for garlicky Mediterranean fare, brunch favorite Open City and District Kitchen for Mid-Atlantic comfort dishes and artsy cocktails in a cozy space. All things pandas at the National Zoo, embarking on hikes through Rock Creek Park, quirky women’s clothing boutique Via Gypset, brunch at Open City, cakepops from Baked by Yael. Take Metro’s Red Line to the Woodley Park station. The neighborhood is highly walkable and Capital Bikeshare docks are located near the zoo and the Duke Ellington Bridge. 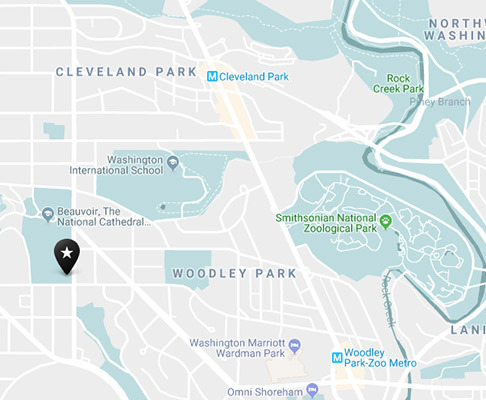 The zoo is just a few blocks from both the Woodley Park and Cleveland Park Metro stations. Enjoy the great outdoors in the middle of DC. With the National Zoo and Rock Creek Park, this neighborhood houses everything from giant pandas to breathtaking waterways. Click below to learn more about what you’ll see in Woodley Park.